HPC Blog For the first time in student cluster competition history, a hometown team has won the Overall Championship award. The team, from China’s Huazhong University of Science and Technology, captured the crown at the recently concluded Asia Supercomputer Community 2016 Student Cluster Competition. This win earns them a berth in the upcoming International Supercomputer Conference 2016 cluster competition and the chance to compete with 11 other teams for the ISC Championship. They also get to take home a sweet 100,000 RMB prize (worth about $15,300 US). The second place finisher, Shanghai Jiao Tong University, also wins a trip to Frankfurt for the ISC16 competition, plus a runner up award of 50,000 RMB. 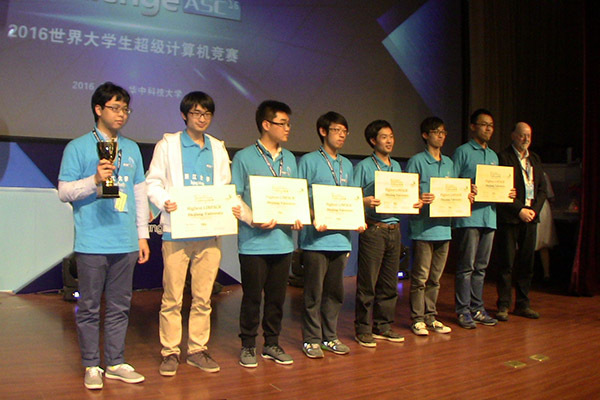 As we reported earlier, Zhejiang University captured the Highest LINPACK Award and prize money of 10,000 RMB. Their score of 12.03 Tflops also sets a new Student Cluster Competition LINPACK record, and something for the ISC16 competitors to shoot for. The competition organizers set up the competition with a 90 per cent weight on benchmarks and applications and a 10% weight on the final team interview. Drilling down inside that 90% (or 90 points) we find that students can earn 25 points based on how well they optimize the DNN (Deep Neural Network) program on Tianhe-2. Student can earn 15 points each for optimizing ABINIT, MANSUM_WAM, and they mystery application, ABySS. Doing the best job on HPL and HPCG can earn students ten points each. As you can see on the chart, Team Zhejiang comfortably won LINPACK with their record breaking score of 12.03. Team Hong Kong (and our buddy Freeman) grabbed second place, narrowly edging out Team Nanyang. Honorable mention goes to Team Shanghai for their 9.73 mark. All three of these teams were sporting small four node clusters with a double brace (eight) NVIDIA K80 GPUs. 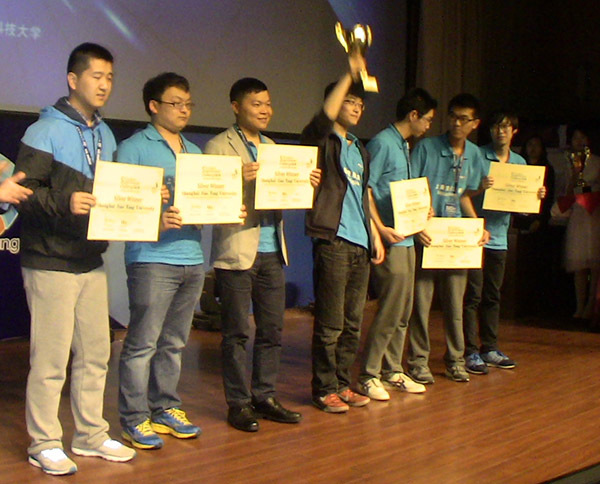 Team Zhejiang was also first on the HPCG benchmark, with a score of 473.38 Gflops. Team Nanyang took second place with 421.54, with Team Dalian and Team Hong Kong pulling third and honorable mention respectively. Team Dalian is an outlier in this group, since they’re running a cluster with seven nodes and seven K80’s, which packs quite a punch – just not quite enough to get them into the top two slots. On MANSUM_WAN, Team Zhejiang once again took first place, scoring a neat 12 on the app. Team Beihang got into the standings with a score of 10.97 (let’s just round that off to 11, ok?). The third and fourth place teams, Tsinghua and Sun Yat-Sen, were quite a bit back with scores of 6.44 and 6.07 respectively. Notice that the eventual overall champion, Team HUST, isn’t mentioned in the above results. Team Shanghai scored a fourth place finish on HPL, which isn’t worth a whole lot of points. So what happened? Since I don’t have scoring information on ABINIT, ABySS, or DNN, I can only speculate. From what I heard, Team Zhejiang had some problems with DNN, which, if severe enough, could have shaved a whole bunch of points from their overall score. With DNN having such a high weight in the scoring, the winning teams (HUST and Shanghai) must have really nailed it in order to make up ground on Zhejiang and Nanyang. There are other scenarios, but that’s the most likely in my mind. Again, without having access to full scores, there’s not a whole lot to talk about when it comes to how the teams finished. The next competition is ISC16 in mid-June, we’ll be covering it wall to wall, so stay tuned….